With a rich history going back thousands of years, Tynside is the industrial and commercial heart of North East England. 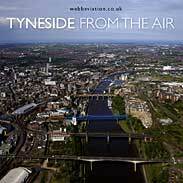 The book contains over 150 images drawn from the Webb Aviation Aerial Photographic Library with subjects ranging from Newcastle's 14th Century Augustinian Friary to the Gateshead's new Sage Building opened and locations throughout Tyneside including Newcastle, Gateshead, Jarrow, South Shields, Hebburn , Tynemouth, North Shields, Cullercoats, Whitley Bay and Wallsend. Tynside is an area in the midst of great change which has been captured in the book with images of the remaining shipyards together with the new riverside apartments and marinas which have replaced much of the old heavy industry. The photographs are taken by me, Jonathan Webb, using the latest professional digital photographic cameras and specialist lenses including an extremely long focal length image stabilized lens mounted on a gyro stabilizer specially developed for aerial photography which has enabled probably the highest resolution civilian aerial photographs of Tyneside ever taken from a moving aeroplane. This has allowed me to capture some remarkable images such as his images of the Newcastle Green Festival and the Earl Grey memorial.